Doug Powers is on Michelle Malkin’s Web site, tracking the actions of Debbie Wasserman Schultz. 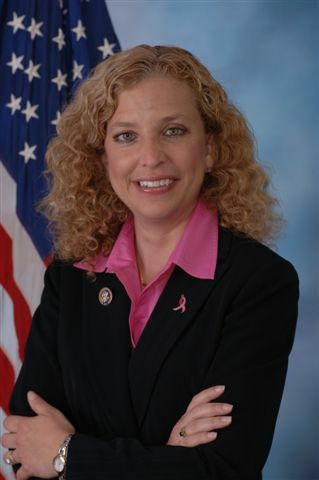 Congresswoman Schultz represents the 20th Congressional District in Florida, an area between Miami Beach and Fort Lauderdale. Ms. Schultz is now the Chairman of the Democratic National Committee. As such, she provides leadership for the Democratic Party in America. Her viewpoints and goals are on display in this YouTube video. It is interesting to contrast Debbie Wasserman Schultz with John Stuart Mill. Mr. Mill was a 19th Century British Philosopher (1806-1873), best known for his book “On liberty.” His work covers principles of freedom, including the moral and economic freedom of the individual when it is in conflict with the authority of the state. Mr. Mill saw danger in society and government, and expanded on Alexis de Tocqueville’s concept of the tyranny of the majority. He verbally fought against the suppression of individual freedom that is incidental to the expansion of governmental power. The worst offense of this kind which can be committed by a polemic is to stigmatize those who hold the contrary opinion as bad and immoral men. I think the president was clearly articulating that his position — the Democrat position — is that we need comprehensive immigration reform. We have 12 million undocumented immigrants in this country that are part of the backbone of our economy. And that is not only a reality but a necessity. And that it would be harmful if — the Republican solution that I’ve seen in the last three years is that we should just pack them all up and ship them back to their own countries, and that in fact it should be a crime and we should arrest them all. I mean that was the legislation that Jim Sensenbrenner advanced a couple of years ago. Republicans are clearly portrayed as bad people, wishing to arrest all undocumented immigrants and “ship them back to their own countries.” Ms. Schultz also invokes the moral authority of the Democratic Party to ensure “the Republican solution” is stopped. --If 12 million undocumented immigrants are “a necessity,” what number would be optimum? --Why do you find John Stuart Mill’s philosophy misguided? Not to encourage guilt by association, but here is an article about the police tactics being used in what appears to be Congresswoman Schultz's district. Noemie Emery has a defense of Allen West in The Examiner. Her remarks are in response to a political attack (now becoming idiosyncratic) by Debbie Wasserman Schultz.